The INS Vikramaditya will host Indian Prime Minister Manmohan Singh, who will spend a day on board the Russian-built aircraft carrier, The New Indian Express reported on its website. The Indian Navy is preparing the flagship aircraft carrier by integrating its MiG-29K naval combat jets and squadrons in order to present it with its full complement of prowess to the prime minister, according to the paper. Manmohan Singh will be on a day-long sailing, preferably before the schedule of the 2014 general elections is announced by India’s election commission, the paper added. The prime minister will be accompanied by India’s defence minister A K Antony, the country’s naval chief Admiral D K Joshi, and head of the Western Naval Command Vice-Admiral Shekhar Sinha, the senior-most naval combat aviator at the moment, according to the paper. The INS Vikramaditya was handed over to India in November in a ceremony at Severodvinsk and left Russia in December, before arriving in Karwar last month. India has since proposed that the servicing period of the aircraft carrier be extended from 20 to 40 years. Sevmash representatives are scheduled to visit India next month as part of an intergovernmental military cooperation commission, according to RIA Novosti. The warship, previously known as the Admiral Gorshkov, is a Project 1143.4 or modified Kiev class aircraft carrier commissioned by the Soviet Navy in 1987 and decommissioned in 1996 after cuts to the Russian Navy fleet. The ship has a displacement of 45,000 tonnes, a maximum speed of 32 knots and an endurance of 13,500 nautical miles (25,000 km) at a cruising speed of 18 knots. 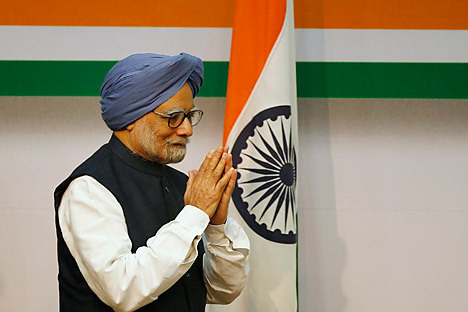 Manmohan Singh will not be seeking a third term as prime minister of India and will step down after heading the Indian government since 2004.